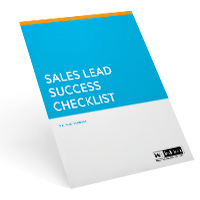 Identify the best prospects for your B2B lead generation programs. When searching for leads to buy your products or services, you want to find those companies who have a problem for which you have the solution. How do you go about finding those companies and how do you find the level of contacts you need from within the companies? Gross revenue. Place the largest companies at the top of the list and the smallest at the bottom. Profitability. List from “most profitable” to “least profitable.” Keep in mind that the most profitable are not necessarily those with the most gross revenue. Fit. Which companies represent the best fit for what you are selling? This ranking is more subjective than the first two. It identifies the companies you know well, those with business you understand, those that are fun to work with, those you understand best and those with which you have-or could have-a great working relationship. Rank these companies in order, descending from the best fit. Your ideal customers are those that are at, or near, the top of all three lists. Are they small, medium or large businesses? What is their Standard Industrial Classification (SIC) code? What are the titles or job functions of their decision-makers? This information will help you focus your efforts to find similar companies and decision-makers to target with your marketing efforts. Determine what is unique about them so that you can find more like them. In addition to looking at your current customer base, review your company’s internal expertise and credentials to determine likely prospects for your solutions. If your company is a start-up and has no existing customers, you can leverage your own past experience and that of your people. Think about the kinds of companies you and your team have had success with in previous jobs. You also can educate yourself on a vertical market (i.e., a particular industry, such as residential or commercial construction, banking, distribution or the retail clothing business), weaving the industry’s concerns and buzzwords into your marketing-for-leads materials. This will suggest that you do understand the market and its needs. However, be prepared to answer the question, “Who else in my industry have you served?” It is bound to come up. If you don’t believe you can successfully sell into vertical markets, consider horizontal markets. These are markets that cross industry lines. For example, you would target small- to medium-sized businesses in need of material handling equipment. Another way to look at the marketplace is geographically. Then you would focus on targeting companies within a particular area, whether it is a city, state, region or country. Although theoretically every company, in every business, may benefit from your solution, you can’t afford to try to be everything to everyone. You must pick the companies with which you are likely to have the best success and the individuals within those companies who are in the best position to recommend or buy your products or services. The next step in targeting your marketplace is to determine to which media the target audience is exposed. For example, what trade magazines do they read? This may include national publications, regional magazines or the regional editions of national publications. Add these to your lead generation plan. Websites your target contacts visit for professional information. Professional associations to which they belong. Conferences and tradeshows they attend. Newsletters to which they subscribe. Each of these, potentially, is the source of a mailing list, Website, conference or publication that would be appropriate for reaching your target contacts. You are now ready to devise ways to utilize these target resources to generate leads. Direct response marketing, which utilizes direct mail or direct response print advertising to generate inquiries. PR in industry or trade publications, newsletters or Websites. Online marketing, which utilizes email and/or banner ads with strong offers and easy-to-use response forms to catch searchers. Company Websites that have been optimized to be found at the top of search engine results and bridge the gap between marketing and sales with more in-depth pre-sales information. Relationship marketing to nurture and qualify the longer-term prospects. Events to help move prospects towards purchase. Sales tools to help your sales team sell. Do you know qualified business leads when you see them?